I saw this show on TLC called "My Unique Family." 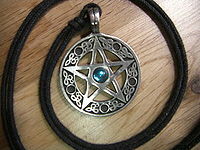 This particular episode is about a Wiccan family. As I watched, I was painfully reminded about how I strive to keep my own spirituality in check in my own community; how I do not wear my pentagrams in public anymore after experiencing both ridicule and ignorance, how many members of my own family believe that I am not religious at all, how my altar is "an eclectic collection of knicknacks" and my goddess art and writing are "expressions of my feminism." It's hard enough to explain to my family and some friends why I keep my own last name and why I had issues getting married, let alone explain my pagan faith.